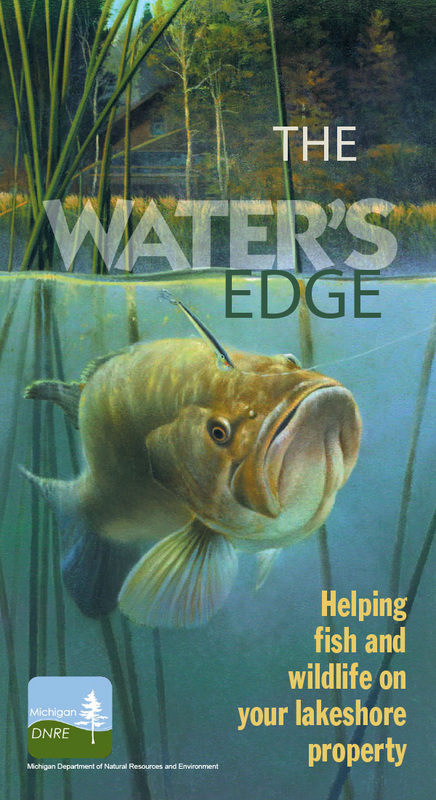 Download the pdf or stop in to pick up a copy of this publication at the Tip of the Mitt Watershed Council office. Printed copies are available while supply lasts. This 24-page booklet was developed to promote low impact development (LID) strategies for managing stormwater runoff to eliminate pollution entering our local waters. Whether to satisfy the prescriptive standards for a new build or remodel, as a voluntary retrofit for an existing stormwater system, or simply to beautify the landscape, readers can explore LID options, such as rain gardens, green roofs, permeable pavements, greenbelts, bioswales, native plants, and rain barrels. 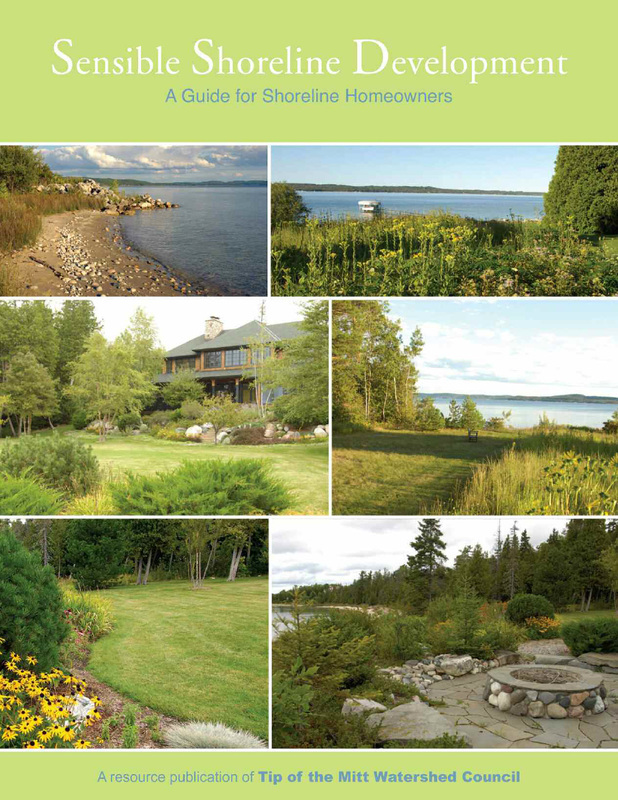 Available as a downloadble pdf and in hardcopy at Tip of the Mitt Watershed Council. This publication was made possible through a grant from the Charlevoix County Community Foundation. This 20-page booklet was developed to promote low impact development (LID) strategies for managing stormwater runoff to eliminate pollution entering our local waters. 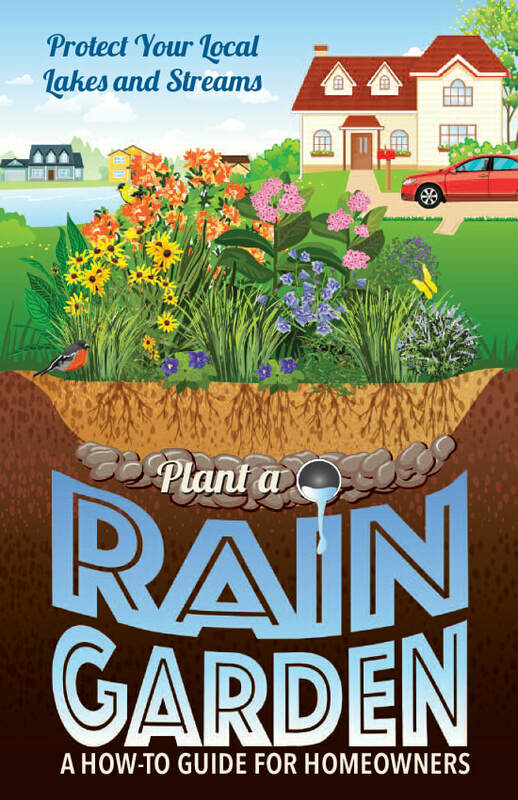 Whether to satisfy the prescriptive standards for a new build or remodel, as a voluntary retrofit for an existing stormwater system, or simply to beautify the landscape, readers can explore LID options, such as rain gardens, green roofs, permeable pavements, greenbelts, bioswales, native plants, and rain barrels. 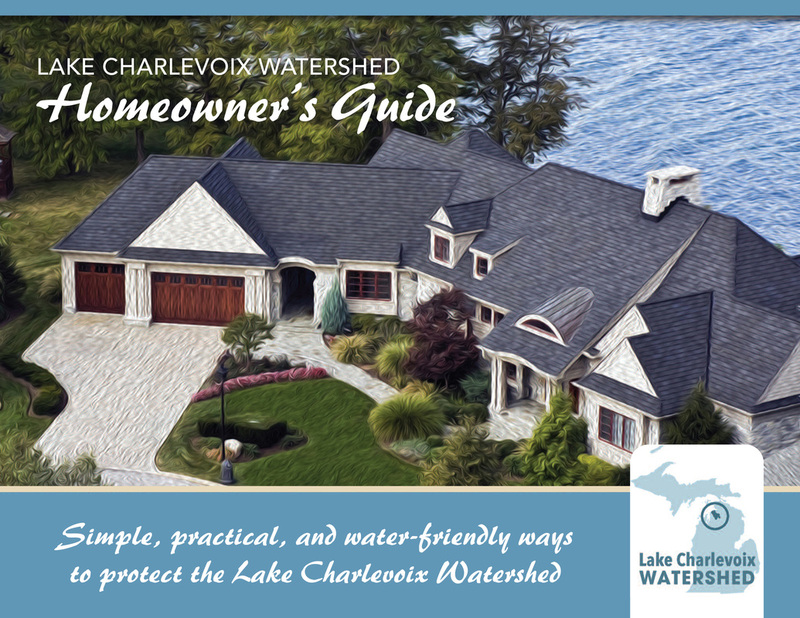 Whether you're building a new home or modifying your existing developed property, the information in this brochure will help you make environmentally sound decisions that can help preserve the character and quality of the land and water that surround you. For additional information, check out our "Protecting What You Love" video series. 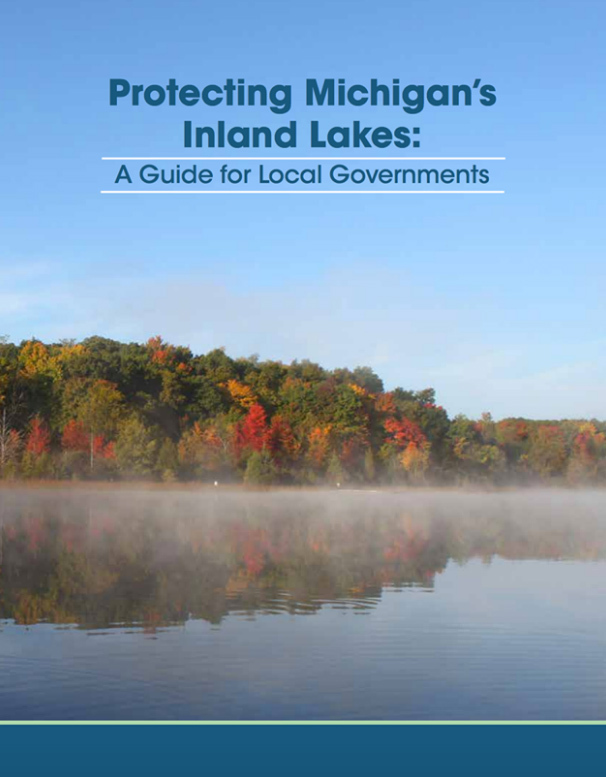 This guidebook is designed to help local officials and concerned citizens understand the benefits of inland lakes to communities, the regulations that govern inland lakes, and the opportunities for protecting them at the local level. Protecting these important resources does not always require elaborate or expensive regulations. The following chapters will outline a variety of inland lake protection techniques, from the simple enforcement of existing statutes to comprehensive ordinances. Produced by the VanBuren Conservation District, funded in part with an EPA Wetlands Program Development Grant. At first glance, the process of obtaining a permit looks complicated and difficult to understand. This booklet was written to help you better understand which permits you may need when doing certain types of work. This booklet is meant to be a guide only. Always check with the appropriate agencies/offices before beginning any work. 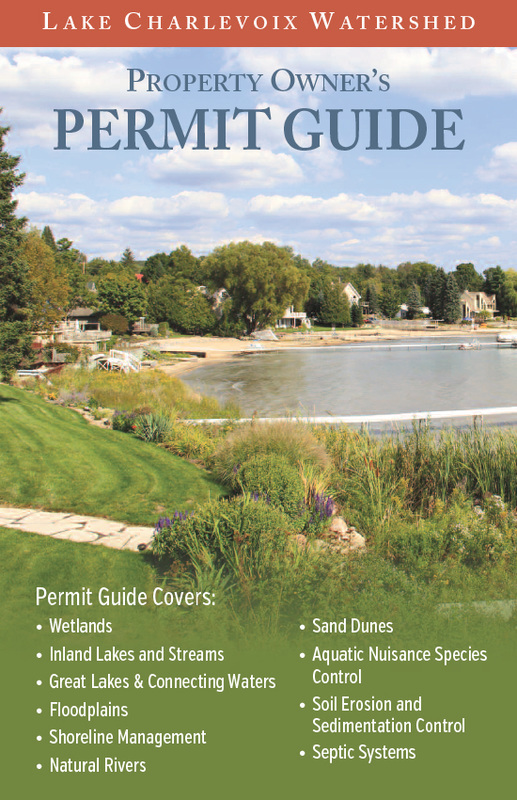 The Permit Guide covers: wetlands, inland lakes and streams, Great Lakes and connecting waters, floodplains, shoreline management, natural rivers, sand dunes, aquatic nuisance species control, soil erosion and sediment control, and septic systems. A shoreline greenbelt is a strip of diverse vegetation, either naturally growing or planted, along the shoreline of a lake or stream, usually consisting of a mixture of trees, shrubs, ground cover, and wildflowers. Shoreline greenbelts offer waterfront residents an attractive way to protect the water quality of their lakes and streams; and all the while maintaining lake access and use. 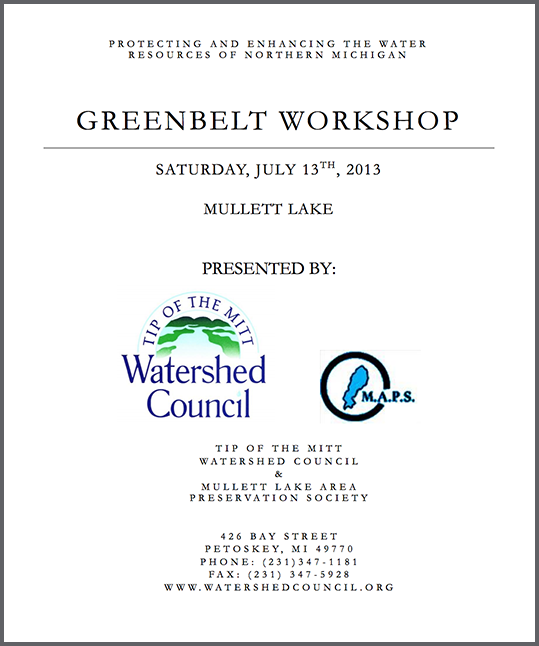 Although this packet was specifically designed for Mullett Lake riparians, the packet contains information about the importance of greenbelts and how to establish and maintain a greenbelt. It also features greenbelt examples, site planning and design tips. Provides a broad overview of stormwater pollution, including runoff from residential and commercial properties, farms, construction sites, automotive facilities, forestry operations, and others. This publication was produced by the Environmental Protection Agency. This guidebook focuses on the erosion and sedimentation caused by the energy of streams and inland lakes acting on their shorelines. Utilizing the information contained in this guidebook and following an organized plan to assess problems and evaluate the pros and cons of potential solutions, the likelihood of choosing an appropriate and successful action will be improved. By using a softshore approach to landscaping your waterfront property, you can help preserve the very things that likely attracted you to lakefront living in the first place – clean water, abundant wildlife, good fishing and access to recreation. Shoreline habitat consists of many natural elements woven into the lake ecosystem to form a web of life. Native vegetation, bottom materials, and natural debris play essential roles in the life cycles of a lake's fish and wildlife. Nearshore alterations that damage or destroy these habitat components sever essential strands in the web. A healthy lake doesn't just happen. It comes about when shoreline property owners and others living in the watershed take steps to ensure the lake's ecological health. This brochure helps identify management practices that ensure a our Michigan shorelines stay healthy and abundant. This brochure is a perfect companion for planning your landscape. View a full list of native trees, wildflowers, grasses, and shrubs. It also contains a list of non-native species that you need to avoid. This colorful brochure lists several alternatives for each of the invasive species listed in this brochure, both native species, both native species and non-native species that currently show no sign of becoming invasive. A great companion for your next visit to the nursery. The Threat is real. Prevention is Easy! 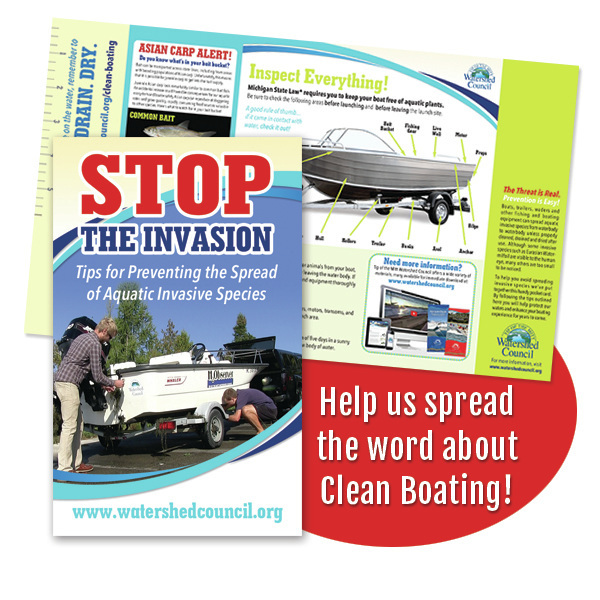 Boats, trailers, waders and other fishing and boating equipment can spread aquatic invasive species from waterbody to waterbody unless properly cleaned, drained and dried after use. Although some invasive species such as Eurasian Watermilfoil are visible to the human eye, many others are too small to be noticed. 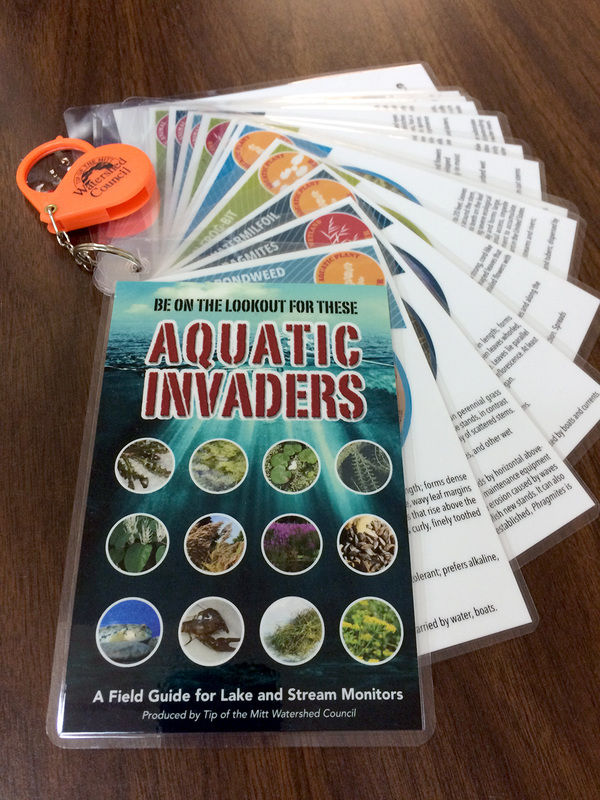 To help you avoid spreading invasive species we’ve put together this handy pocket card that fits easily in your wallet, purse, or glovebox. By following the tips outlined inside you can help protect our waters and enhance your boating experience for years to come. Thanks to a grant from The Joyce Foundation, Tip of the Mitt Watershed Council was able to prepare and print a series of aquatic invasive watch cards for their volunteer lake and stream monitors. The set includes detailed photos and information for identifying specific invaders. CLICK HERE to download the entire card packet or click on the individual invasive species below to download a single card. ​please call 231-347-1181 or email info@watershedcouncil.org. 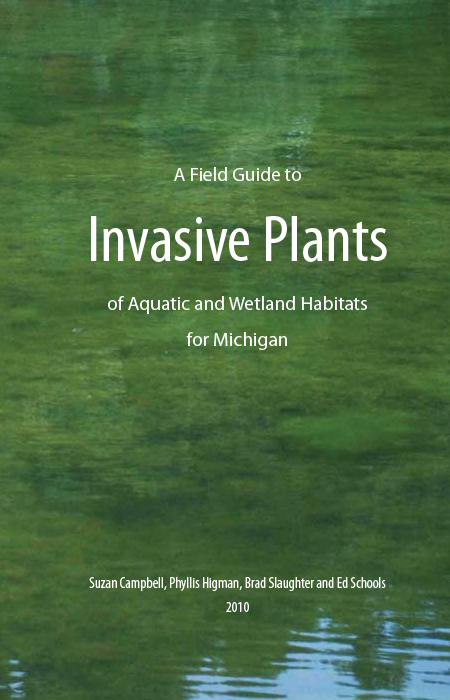 This booklet was developed to help managers of wetlands and aquatic resources identify invasive plant species that may pose a threat to their management goals. Detecting these plants during the early phase of their invasion is essential to achieving cost effective removal or control. Reproduction for commercial purposes is strictly prohibited. Phragmites is becoming a widespread threat to wetlands across the Great Lakes basin. The perennial grass that can grow up to 15 feet tall creates dense stands that degrade wetlands and coastal areas by crowding out native plants and animals, blocking shoreline views, reducing access to water for swimming, hunting and fishing and creating fire hazards. 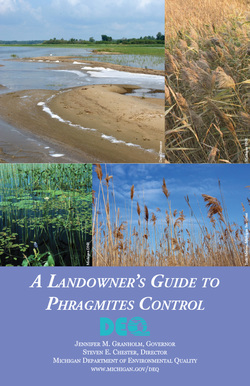 This booklet helps identify phragmites and outlines some of the common control methods homeowners and resource managers have access to. Download it here. For hard copies of the brochure contact the Office of the Great Lakes at 517-335-4056. 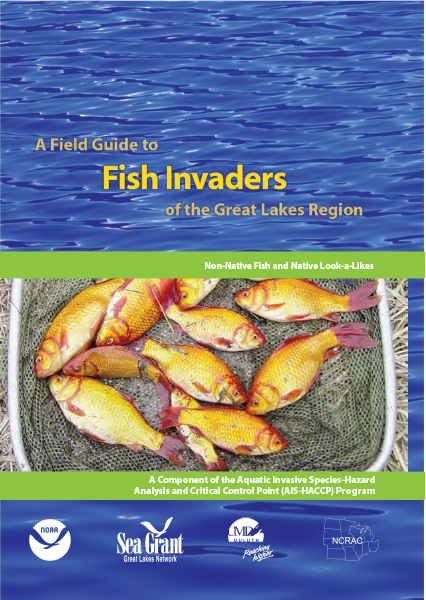 This 20-page, waterproof, pocket-sized guide highlights harmful aquatic invasive fish found in the Great Lakes Region. Similar-looking native fish are included for comparison. The guide's purpose is to assist private and public fisheries personnel in identifying and reporting potentially invasive fish species. It is also designed to accompany Aquatic Invasive Species-Hazard Analysis and Critical Control Point (AIS-HACCP) training workshops and materials. Click here to download a copy for free. For a hard copy of this publication, visit Minnesota Sea Grant.